3 The Evolution of Our Guts: Where Did The Carnivore Diet Come From? Many pieces about the carnivore diet start with a declaration by the author that they are no doctor or scientist. In our case that’s irrelevant, because both agree that there is no conclusive cure for IBS or IBD, such as Crohn’s, ulcerative colitis, and pancolitis. This website is about discovering safe alternative methods to reduce symptoms when standard methods are so ineffective or problematic that even professionals admit there are no answers. The carnivore diet may not be any better than any other diet, whether that diet includes no meat, some meat, or all meat. There are no answers or assertions here, only suggestions and observations in search of a healing solution in the face of lifelong or life threatening pain. Modern society has always been obsessed with fad workouts and diets. The ketogenic and paleolithic diets have recently become two of the trendiest, and many who suffer with IBS or IBD have found some solace with them. Recently many dieters and professionals have put them together to obtain the advantages of both. What research and experience has found, however, is that combining the two can provide even more benefits, particularly to those with Crohn’s and ulcerative colitis. This diet focuses on animals and animal byproducts and is formally called the paleolithic ketogenic diet, when adhered to strictly it’s also called the zero carb diet, or, more colorfully, The Carnivore Diet. The Evolution of Our Guts: Where Did The Carnivore Diet Come From? About 250 million years before we became concerned in removing gluten, carbs, meat, animal byproducts, pork, shellfish, fat, lactose, processed foods, peanuts, anything that our ancestors ostensibly didn’t eat, and fried food from our diets, the Earth went through the Permian–Triassic extinction event, which began the dying off of our ancestors at the time, the carnivorous therapsids. Regisaurus, an extinct Genus of small carnivorous therocephalian (a type of Therapsid). The first mammals appeared a little later, 225 million years BP (before present). And we, Australopithecus at the time, separated from the chimpanzee somewhere between twelve and five, but probably around six or seven, million years before the invention of the deep fryer. What we consider human first showed up with Homo habilis between 2.1 and 1.5 million years BP. H. habilis is the first to be associated with proper carved stone tools, although they had been around in some form for a million years or so, give or take a few 100,000. Homo habilis begat Homo erectus, who famously created fire and later cooking. They in turn begat Homo heidelbergensis, who may have invented clothing. 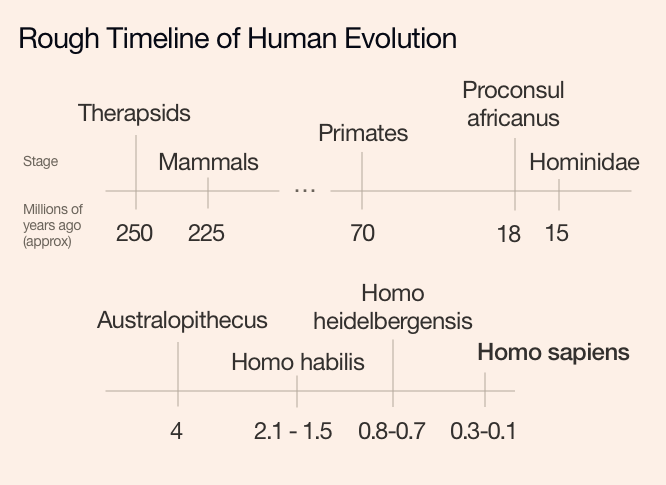 Homo sapiens – that’s us – first showed up about 100 to 300,000 years BP and learned to speak. It’s hard to say when talking about evolution where exactly to mark when we had the best diet or the most influential moment of evolution for our modern guts. We’re unsure exactly when our ancestors ate meat, but we do know that chimpanzees, our closest living relatives which are 94-99% genetically identical to us, are eager hunters, in contrast to earlier observations (a group of chimpanzees can consume up to a ton of meat annually given the chance).1 How much meat we ate in the course of our evolution, how we acquired it, and how frequently we ate it are all interesting questions open to conjecture and debate among scientists. Our gut microbes have been shown to shift rapidly after certain events, such as the invention of tools, major shifts in our eating patterns, like settled agriculture, or a change in climate, and our guts have proven to be remarkably flexible and adaptable to what was available or practical at the time. In the modern day, we just eat whatever is trendy like jello salads2 or fondue3 If you have IBS or an IBD, you should probably stay away from glitter coffee anyway. As the Paleo diet points out, all of these trends, including wheat, are recent. Until 10,000 BP, around the time we started farming, we had been in an ice age for 2.6 million years. Access to plants dropped drastically while research has shown that animal density was quite high. The amount of meat in our diet skyrocketed while the earth was engulfed in cold and we began to use tools to hunt. It is very possible, maybe probable, that our guts adjusted to being more carnivore than omnivore or herbivore from eating mostly meat in the cold for nearly all of the most recent two-point-six million years. About 25,000 years ago the ancestors of the Native Americans, or First Nations if your flag’s a maple, crossed the Bering strait on a land bridge called Beringia. While braving the coldest part of an already freezing planet they were forced to develop a diet of utility that still remained 25,000 years later when the Europeans arrived.4 They were largely carnivorous and famously stressed the consumption of the entire animal. It was a diet high in fat and organs5, and is most directly represented in modern day by the Inuit, who have some summer vegetation but rarely touch it, save the occasional bit for seasoning. Although they do sometimes consume large amounts of berries, in a seasonal way similar to how we sometimes consume large amounts of pumpkin spice. Weston A. Price, dentist extraordinaire, performed quite a bit of fieldwork in the 1920’s and 30’s for his book “Nutrition and Physical Degeneration,” during which he interviewed Romig and wrote the quote above. His most interesting observations were, likewise, about the Native American diet.6 He claimed that he had even witnessed Native Americans contract influenza and survive by returning to their homes to follow their traditional lifestyle and consume traditional foods. There have been more recent studies, several in the last ten years. A 1972 study on Point Hope, Alaska found that average total caloric content was 3,000 kcal per person. 50% of those calories were fat, 30-35% were from protein, and 15-20% were carbohydrates, but those carbs were mostly from glycogen (animal starch) in meat. Glucose was largely limited to tea or coffee sweetener, something that did not exist in their traditional diet. The results of this research found that heart disease among residents of Point Hope was ten times lower than the US average. The levels of fat in their bloodstream were measured as 85 mg/dl, down from an average of 100 mg/dl. This was from a diet that consumed 50% fat. They were found to rapidly gain weight and cholesterol while moving towards a more western diet. There has also been recent research on the Masai of East Africa, where only one male had a heart attack out of the 600 that were studied. They had a diet of 66% pure animal fat, that’s 300 grams of fat and 600mg of cholesterol every day. For reference, Americans are advised to keep cholesterol under 300mg, 20-35% of calories. Other total or near-total meat-eating cultures include the Eurasian Steppe Nomads, the Gauchos of Brazil, Russian Arctic Chukchi, and the Sioux of South Dakota. Paleomedicina has been researching Carnivore since long before it was cool. Over 20 years ago, Robert Atkins put forward the Atkins diet, in the family of diet known as low-carb, high-fat (LCHF) (LCHF). Doctors and scientists were naturally skeptical of something that was generally described by their community as something that will kill you. Even though many medical professionals practiced it themselves, they were wary to prescribe. The research wasn’t there and the perceived risk was too great. At that time, we really knew very little about the diet or how our bodies digested and absorbed what they needed. Today, physicians readily prescribe a low carb diet to their patients as a temporary diet or a lifestyle change, having observed or experienced the sustained effects themselves. Many IBD sufferers have gone on and off of it with success, not only with pronounced weight loss, but relief from IBS. Here’s the thing. Despite a mountain of success stories, research, and acceptance from the medical community, in the nearly 50 years (since 1972) of its existence, what we call the Atkins diet has never been fully confirmed by science, particularly in the long-term. For weight loss, The Lancet questioned its central claim, that burning fat offers a metabolic advantage over burning carbohydrates, concluding that the weight loss was a result of a reduction in caloric intake due to to the monotony of the diet.7 Weight loss, however, is incidental to our aims. As for mortality, if a patient on Atkins dies tomorrow or at 90 we will never know if their diet was the cause. Another LCHF diet, specific carbohydrate diet (SCD) has been in use since the 1950’s and because of that, has extensively more evidence on its results for those with Crohn’s and UC. The carnivore diet is a combination of the ketogenic and paleolithic diets and shares a lot of their characteristics and benefits, but works in many different ways. It also shares similarities and overlaps with the specific carbohydrate diet (SCD) and low FODMAP (Fermentable Oligo-, Di-, Mono-saccharides and Polyols) diet which have been well researched for their relief of IBS and IBD. Eating meat alone actually overlaps with quite a few diets, but those are the most relevant and familiar to those of us with IBS and IBD. FODMAP works by limiting high FODMAP foods that would otherwise be difficult for some of us to digest until they are fermented by the gut bacteria at the end of the intestines that produce hydrogen and lead to gas, bloating, cramps, general pain, constipation, and many psychological issues such as anxiety and depression. It’s useful because it can isolate and discover particular foods that may be causing problems. As with many gut issues, different foods are offenders for different people. The removal of all potentially FODMAP producing foods is the most restrictive, but then they can be reintegrated slowly so that each individual can discover their own personal demons. Carnivore is a much more serious reduction, and it’s suggested you start by removing everything but meat. Then slowly add things like dairy, coffee, and perhaps alcohol. In some schools of carnivore thought you can even experiment with adding limited vegetables. Carnivore has the most in common with keto, and shares a similar goal of reaching ketosis in order to switch from a carb-based metabolism to a fat-based metabolism. There has also been research that the state of ketosis causes enhanced mental clarity and focus8. It shares with paleo the prevention and cure for problems caused by carbohydrates and additives. When the two are combined as carnivore, there are even more interesting changes to our bodies, as well as our IBS and IBD. Paleomedicina suggests that, while the paleolithic diet removes excessive carbohydrates and additives and the ketogenic diet puts the body into ketosis, neither address the very thing that truly makes the paleolithic ketogenic diet unique and why it has massive application if you have an IBD or IBS: intestinal permeability. Our intestines are meant to be permeable. Intercellular tight junctions are supposed to allow nutrients to be absorbed while keeping antigens out. Today, those junctions are generally open too wide, enough that disease is able to stay within our body rather than being forced out as intended. Increased intestinal permeability leads to more disease and more harmful diseases, and those are a big problem, but of more concern to IBS, UC and pancolitis. The body responds to the invaders by triggering the immune system and increasing inflammation. As we keep seeing on Guthack, it’s generally agreed that IBD could be caused by a genetic predisposition to unusual immune responses while reacting to certain bacteria. That alteration leads to inflammation. For those visitors who might not be familiar with IBD, the I stands for inflammatory. Although the link is not clear, increased intestinal permeability is also known to be a cause of Crohn’s, UC, IBS, and pancolitis. For the rest of you, increased intestinal permeability is also linked to diabetes, arthritis, fatty liver, joint diseases, obesity, liver problems, allergies, schizophrenia, and even cancer. The Paleomedicina Clinic offers extensive resources on the subject, but beware, the site is only partially in English and does not always play well with Google translate. Nutrition is often a personal discovery, while there is an abundance of work about how nutrition should affect humanity as a whole, ultimately, each of our bodies work differently of our genetics, environment, lifestyle, upbringing, health history, and a biochemistry that identifies us all as uniquely as a fingerprint. Those of us who suffer from diseases such as IBS, Crohn’s, ulcerative colitis, or pancolitis have our own factors that make us different. In an absence of greater research, we can feel better trying it on our own to see how it applies to our own personal biology. Luckily, Sean Baker, one of the most notorious proponents of going carnivore, is working on just that and we hope to do the same for IBD and IBS, or anyone who wants to share their experience. If you’re on prescription drugs, have a doctor monitor your situation. Particularly with blood pressure, your body will be going through changes and that may make your prescription put you at dangerous levels. If you have some sort of problem that precludes it, you have trouble adhering to things strictly, or staunchly object to consumption of animals and animal products, a perfectly valid objection, this diet is not for you. We find many diets seem to be complete opposites in appearance, but ultimately what is important is to match essential nutrients, not foods. If we know what we are eating and how that affects our bodies we don’t have to look for diversity in the food we consume. We only have to meet the body’s requirements. Another great thing about eating carnivore is that you don’t have to worry if you don’t want to micromanage. There is no fake broccoli, mushroom, or soy product made entirely of meat. When you invest yourself in being carnivorous, you only eat one thing: meat. You can learn new techniques, cuts, sources, and seasonings as you go along, essentially picking up a new hobby. Even if it isn’t for you, the Carnivore diet is safe to try and many Crohn’s and UC patients are experiencing full remission of problems that were considered permanent conditions. One of the most famous testimonies on the internet, Crohn’s Carnivore, reported that after six years of the diet, and three years since his last colonoscopy, his doctor found him to be indistinguishable from someone without Crohn’s. The Carnivore diet is one of the most promising, safe, and surprisingly simple methods to relieve Crohn’s, Ulcerative Colitis, and Pancolitis. Eat meat. Eat when hungry. Eat until pain-free. There’s a fantastic visualization of these early human migration patterns at the Bradshaw Foundation. Requires Flash and doesn’t work on mobile, so here’s a link to a video version. There is a fascinating and much debated piece on the topic, Guts and Grease: The Diet of Native Americans. Detailed writeup previoulsy linked above. The first sentence “The Carnivore Diet is a member of the Low Fat High Carb (LFHC) diet family…” should be LOW CARB, HIGH FAT (LCHF), no? Interesting article otherwise. I’ve been almost completely free from IBS, chronic muscle pain/fibromyalgia, arthritis pain for almost 2 years and have lost over 90lbs by following a ketogenic diet, but I’m looking into carnivore as a next step in gut healing. Thanks for the info! Thanks for the comment and great catch. It should be “low-carb, high-fat (LCHF)” – correct in the article itself. If you do start the diet, we’d love to hear how it goes vs. keto.